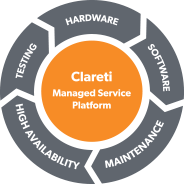 Clareti Transaction Control (CTC) has been designed to provide financial institutions with complete certainty in their reconciliation processing. CTC combines best-in-class performance with future-proofed technology, providing real-time reconciliation and matching based on business-driven controls. In short, CTC provides financial institutions with a robust, comprehensive and cost effective solution to meet the increased focus on real-time financial certainty. Reporting Capabilities CTC Onboarding Accelerator that provides rapid deployment of new controls & automated documentation. Reforming City Culture - Is this Really the Best Banking Can Get?